Published: Apr 10, 2014 to ? A year and a half after the end of the first series, there is a meeting between a boy—traveling to Ikebukuro in the capital to seek the Headless Rider—and a girl, whose older sister vanished chasing it. Thus, the extraordinary begins! Although, presumably one would know to finish Durarara!! itself before reading SH, I'll add it in here just in case. 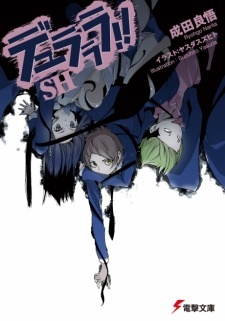 SH is a great sequel if you're craving more supernatural hijinxs, but fails to introduce a complex, multilayer plot that we've seen in the original Durarara!! It also can't seem to introduce new plot elements (with the exception of one protagonist's "abilities", so while it's changed up a little, we still see the same Blue Squares, same Dragon Zombie, same Awakusu-kai. As usual, I instantly enjoyed reading about all of SH's new cast. Although at first two of our new Raira-trio protagonists may seem like Izaya and Shizuo rips, they eventually grow into their own individual characters. Our third new protagonist, Himeka Tatsugami, is outspoken and cold, very unlike our quiet, timid Anri, which is a nice change. Aaaannndddd...that was all that was good about it. Yes, we get several members of our old cast back, but while we all want more Shizuo, Shinra, Akane, Aoba, and Celty, the lack of new characters (and in fact, the lack of characters, SH only has maybe 7 or 8ish characters play a role in the plot thus far) is a far cry from the 30 or 40 character cast of the original work. This is a LN (so not really focused on the art), but it was decent, average for Durarara!! I personally love Durarara! !, so SH is a fun read. Although the lack of new elements bothered me slightly, I love the old characters as well, so my enjoyment wasn't really affected. Plus, we're only a few volumes in so my hopes are still high! If you loved or even just enjoyed Durarara! !, SH will certainly give you a good time. It's still full of Durarara!! 's classic charm with a somewhat-fresh cast of characters. There isn't as much new material as I would've liked, but it's still enjoyable to read. Should I read these after the end of the anime?